NEW BRAUNFELS, Texas -- They say The Bandit will steal your heart -- a masked bandit, the raccoon, serves as its logo. Very fitting. But The Bandit will most likely steal your Pro V1s more often than your heart. The Bandit is a Hill Country treat located minutes east of the historic German settlement of New Braunfels. Keith Foster designed this strategic, tough challenge with 12 water holes along the deep, jagged edges of Long Creek with No. 12, Bandit Point, a 468-yard par 4 nestled against Lake McQueeney. The green sits peninsula-like, stealing even more when approaches are struck without precision. The Bandit, The Buckhorn and The Republic are three dandy golf courses from Foresight Golf, and an emerging architecture name, Art Schaupeter, who trained under Foster, and helped design all three, although his name is only on The Republic in San Antonio and The Buckhorn in Comfort. You can play each course for under $50 -- The Republic costs the most, The Bandit a notch below and The Buckhorn is the most affordable. "The Bandit is a little more demanding off the tee and most agree it is the toughest of the three layouts," said Schaupeter, who was born in went to college in Colorado. "The Republic has a lot of charm and subtlety and you have to place the tee ball in the correct positions in order to score. The Buckhorn is more playable and was built with a lower price tag, but I think you still get an upscale experience at a fair price." One of the best things about The Bandit is that it takes an effort to get here. It's convenient to I-35, but a golfer just breezing through town has to make an effort to find it. Foster, who also designed the award-winning The Quarry in San Antonio, had great Hill Country terrain, several holes have elevation changes of 100 feet and the Guadalupe River that runs along the 14th fairway. Long Creek winds through 11 holes and can grab a ball at any time. Frequently golfers come off the signature 18th hole and head for the golf shop to tell anyone who will listen that they enjoyed the round better than The Quarry or even La Cantera, the most ritzy golf resort in the Alamo City. No. 18 is a 552-yard, par 5, that can spoil a round in a heartbeat, kind of like many holes on this layout. The fairway bends big-time right and most likely your third shot must carry Long Creek to an elevated green tucked in the trees like an amphitheater. The green is so treacherous that you might scream when you see the results of your first putt. You have to play this green multitudes before ever mastering it. Look for the little cemetery adjacent to the putting green. These first settlers came in 1868 and were from Hanover, Germany, and originally built a cotton gin here. 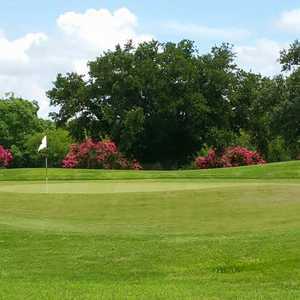 Built entirely on a flood plain of the Salado Creek, The Republic Golf Club, is located just off Military Drive on the southeast side of the Alamo City. It is less than a mile east off Interstate 37, but most of the day will be spent in a forest of live oaks and elms and busy streets can't been seen except from the 10th tee. Folks who once hunted on this land said it was deep forest, but thankfully Schaupeter and his crew saved many gnarly, huge trees and used them in the strategic layout. "One interesting thing was we mulched all the trees that were cut down, mixed it with turkey manure and waited a few months," said Schaupeter. "It composted quickly and turned into great black top-soil material. The city really liked that cost-saving measure. 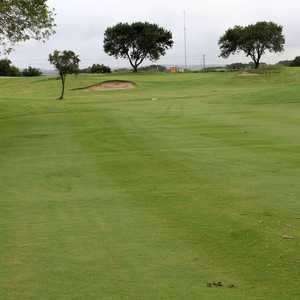 And it helped sway the city to approve its first municipal golf course since stricter tree conservation practices had been implemented." Watch for the huge live oak on the 624-yard par-5 No. 6 just to the left of the green -- just one of many that were saved to be incorporated into the design. It is one of the longest holes in the city and is named "Come and Take It" -- a motto from Texas history concerning a cannon given to the town of Gonzales. The Mexicans wanted it and the Texans issued a challenge to come and take it. Schaupeter said just as final plans were ready, the cultural folks showed up and found an old campsite and fire pit adjacent to the 18th fairway by the creek, which changed where they placed one of the irrigation ponds. This land was just too good, it didn't matter when they had to change the final routing. Schaupeter probably could have used many layout plans that would have made this a must-play in any form. Measuring 7,007 yards at par 71, most fairways are generous but beware of one huge forced carry over a deep ravine on the par-5 11th, 569 yards. The carry is 221 yards from the back -- lose your tempo here and lose your Pro V1. Forty-four bunkers, multi-tiered greens and great conditions are here. Come and get it. Travel about 30 minutes from Fiesta Texas along I-10 and you will find The Buckhorn in tiny Comfort, a small ranching community with a historic downtown lined with antique shops. Schaupeter said the premise here was to have the same high-end feeling as The Bandit with all the amenities and strategic golf, but at a more affordable price. Someone has probably told you golf courses today can't be built under $5 million. Well, they built this one for about $3 million. Only about 90,000 yards of dirt were moved and that came mostly on the irrigation pond on the upper part of the rolling Hill Country terrain. "We pretty much left this ranch land as it was," said Schaupeter. "The Buckhorn is not as intimidating as The Bandit. It easy to find your ball -- just beat it around and go find it and hit again. It does have some subtle strategies and some teeth. The greens are old-fashioned rolling ones with contours, but it is an easy walk, just like The Republic." The Buckhorn features nine water hazards, 27 sand traps and measures 6,648 yards at par 71. If you are a tourist you can head for town and lunch or dinner at Mimi's Café On High Street (830) 995-3470, located in Comfort's 1910 Post Office. Try the special of the day or a German sandwich and top it off with bourbon-laced bread pudding. If you want to base your stay in San Antonio don't miss one of the most spectacular modern hotels in the world -- the Westin La Cantera Resort. The 508-room hotel features the native parchment-yellow limestone rock and a muted red-tile roof giving it a feel of Texas Colonial history. The doors on the first floor echo that period too, along with influences from the 17th-century Spanish Missions, limestone European-style homes found in San Antonio's King William District, and the legendary King Ranch of South Texas. You can also tee it up here at the Resort Course, home to the Texas Open, or the hilly Palmer Course. Head for downtown and Rosario's Mexican Café and Cantina (210) 223-1806. Located in the historic King William district, try the Pollo a la Maria, shrimp nachos and just traditional Tex-Mex entrees. The combinations that include chicken or beef fajitas are superb.